Do you have an old car you want to restore or various hobbies but no room to pursue them, or, just need the extra space to clean out your existing garage? 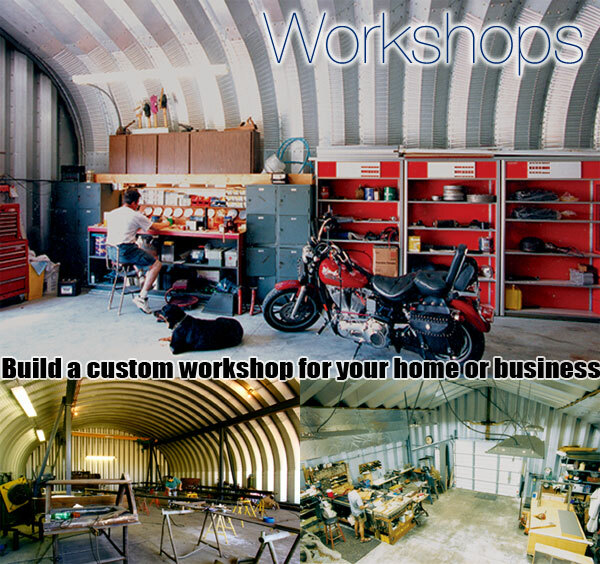 Archcore steel workshop buildings offer the ideal solution. They are simple to erect, durable, price effective, and best of all 100% maintenance free! Our metal workshops are 100% manufactured in the United States and are backed by a 35-year warranty. Our straightwall arch building models and high profile "Q" models make for a great backyard workshop at your home. Their high sidewalls are ideal for putting work benches right at the walls, and can fit tall shelves or racks as well. Electrical and HVAC are very simple to install in all our arch style buildings by simply running your conduit along the bolt lines. A couple of friends and some basic tools will enable you to build your dream pre-fab shop building over a weekend. Archcore steel building kits are simply the best choice for a hobby workshop building and offer the cheapest solution. For those of you that want that custom look or a certain color to match the surrounding area, we offer several different options. We use Akzo Nobel's Ceram-A-Star 1050 Energy Star colors. This paint will not chip, crack, peel, or blister and carries a 40-year warranty. You can also easily customize your own style endwall to suit your needs. Call us today at Archcore and let us help you design your dream shop building. Our attractive steel workshops are the perfect shield against the elements and built to last, the uses are unlimited.